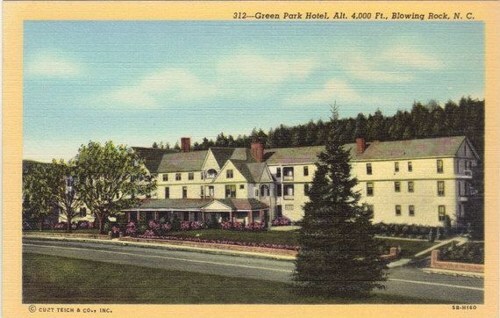 The Green Park Inn was opened in 1891 by a group of 3 businessmen from Lenoir, NC, including Civil War Veteran Major George Washington Findlay Harper on extensive acreage then known as "Green Park". Back then, and for many years, the hotel contained the only United States Post Office for the entire area. (A piece of this original post office remains with the hotel, in our "history room", to this day.) The original hotel consists of over 53,000 square feet, three levels, a restaurant, and bar. In the late 1950s what is now referred to as "the golf wing" was built, adding somewhat larger rooms and balconies, overlooking the Blowing Rock Country Club golf course, to the hotel's inventory. Throughout the decades and generations this Grand Dame of the High Country has hosted such historic and memorable figures as Annie Oakley, J.D. Rockefeller, Eleanor Roosevelt, Calvin Coolidge, Herbert Hoover, and Margaret Mitchell (who penned part of "Gone With the Wind" while a guest of the hotel) and somewhat less notable, though no less important guests as the Smiths, and the Jones and so many more sojourners in search of a night's respite, or a superb and intriguing vacation destination. Given the hotel's physical location, straddling the Eastern Continental Divide (at the gateway to the Blue Ridge National Parkway) and its rich history and significance to the North Carolina High Country, the Green Park Inn was placed on the National Register of Historic Places in 1982. The last of the "Grand Manor Hotels" in all of western North Carolina she remains the state's second oldest operating resort hotel. In May, 2010, the Green Park Inn was purchased by New York hotel "affection-ados" Eugene and Steven Irace. Throughout the summer and early fall of 2010 the hotel underwent extensive infrastructure and systems repair and modernization, as well as having been entirely refurnished. We are proud to say that, having made a commitment to "Buy American", much if not most of the hotel's new furnishings were made in America. For example, most of the room furnishings are Thomasville, and manufactured just down the mountain in Lenoir, NC, or in High Point, NC. The hotel includes 88 guest rooms, approximately two thirds of which have been, refurbished. All guest rooms contain entirely new room furnishings, most have renovated or updated bathrooms, and many have new carpeting. All of the hotel’s public areas have also been refurbished and contain entirely new furnishing, and new floor finishing in most public areas. Work continues behind the scenes to refurbish and reopen even more guest rooms. The hotel’s large outdoor space, below the golf wing, has been entirely re-landscaped with much more open space, and grassed area. This work was completed in conjunction with major drainage repairs and upgrades. The Carolina Room, a 300 person conference and event space, the Blue Ridge Room, the hotel’s smaller 50-60 person capacity meeting room, and a hotel first ever fitness room have all recently been opened. Following a "gut renovation" of the hotel's kitchen facilities that included installation of more than 200 feet of underground plumbing, new 400amp electrical service, one ton of structural steel supports, and entirely new kitchen equipment, the hotel’s Laurel Room Restaurant was reopened to the public in July, 2011. In the spring of 2013, the restaurant facility was completely remodeled, and has been re-christened the Chestnut Grille, a casual mountain dining restaurant. The Proprietors and Staff of the Green Park Inn anticipate even more history being created throughout the many years and decades to come as we welcome you to, or welcome you back to the Historic Green Park Inn. The Green Park Inn is a member of Historic Hotels of America®, the official program of the National Trust for Historic Preservation for recognizing and celebrating the finest historic hotels across America.